A fuse is a safety device. It is simply a thin piece of copper wire usually fixed in a glass tube with a metal cap at each end. The exact thickness of the wire is altered depending on the current that needs to flow to the machine when it is working properly. 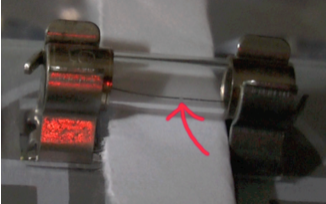 Printed on one end of the fuse is the maximum current that a fuse will allow to flow. The thickness of the wire is calculated to allow the normal current to flow but not much more (there is a tolerance). Fuses are sold in a range of sizes depending on the current they will allow to flow. For example 1 amp, 3 amp, 5 amp and so on. In the diagram below you can see that the fuse is fixed in the circuit in the live wire just after the switch. If too much current flows, due to a fault in the circuit, the wire can get hot. 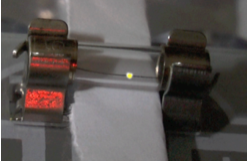 The thin wire in the fuse is the “weakest link”. It will get hot enough to melt and then there is a break in the circuit so that no current will flow. To find the correct fuse for safety it should be just a little larger than the maximum current that will flow. The video below goes through the explanation of how fuses are used and explains how to choose the correct one.